We simplify your life. 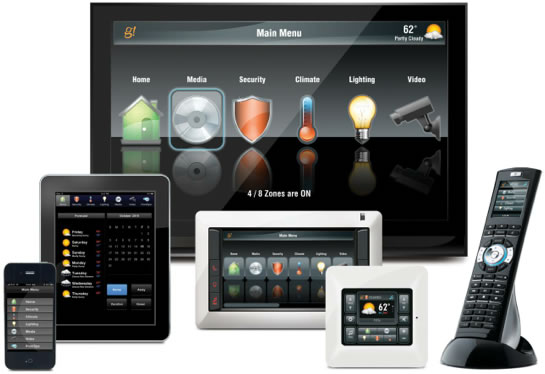 Total Concept Wiring is a full service electrical company specializing in all aspects of home automation. Your favourite music begins drifting through the house when you open the front door. Your blinds open when you awake. Your lights dim when the movie goes on. With an ELANg! system, you become like a movie director, controlling all aspects of your home's automation needs, from your phone, iPad, or wall unit. Let us plan an automation system that matches your lifestyle, your space, and your needs. Over the past few years, there has been an explosion of products and systems developed for audio visual automation in the home and office contexts. Our clients include homeowners renovating or upgrading, executive luxury homeowners, office complexes and boardrooms. We can customize a new system, or we can integrate new features into your existing AV system. Our highly trained staff can solve all the technical challenges which might arise in your job. Our core business at Total Concept Wiring is working with homebuilders, homeowners, and commercial properties to provide the full range of electrical wiring services they require. Since 2007, we have been growing and gaining loyal, satisfied customers who provide us with referrals. Whether it is original wiring, upgrades, replacements and restoration after floods, fires, and other damage, Total Concept Wiring can provide you with experienced, professional service. We help clients move from incandescent or fluorescent lighting to energy efficient LED lights which have an average life expectancy of 50,000 hours. We can install low voltage media (data, communications and network cabling) and CCTVs. In renovations, we can work with your original wiring, or upgrade it if necessary, pull new wire, and give you an analysis on the options available to you. Modern homes require more outlets and wiring than older homes did, so if you are renovating, you might take the opportunity to bring your home's wiring capacity up to your current lifestyle requirements. Your home security system provides you with peace of mind, whether you are at home or travelling. Not only that, you can monitor your security from your phone or iPad while you are away. We can integrate your home security with your interior and exterior lights, your doorbell, as well as interior or exterior video cameras. Audio can be linked to security. For example, we can link your doorbell to speakers with a barking dog track. From your phone or iPad, you can control all your security features and keep an eye on the security situation in your home. We have expertise in very simple as well as sophisticated security systems with cameras, motion detectors and window alarms. At Total Concept Wiring, we use the newest premium technologies from these renowned and trusted suppliers in the industry. We are current with their latest products and we can advise you on which ones best suit your needs for your home or office system.